The constellation of Cepheus contains a plethora of all types of nebulae. Spanning 8 degrees by 5 degrees, this widefield view is peppered with many of these nebulae. Included in this image are the Wizard Nebula (the large and bright red emission nebula towards the upper left), the Lion Nebula (Sh2-132 - the large emission nebula near the bottom of the image), Sh2-134 (the large and faint complex of emission nebulae at upper right), and Barnard 171 (the large dark nebula in the upper right corner). 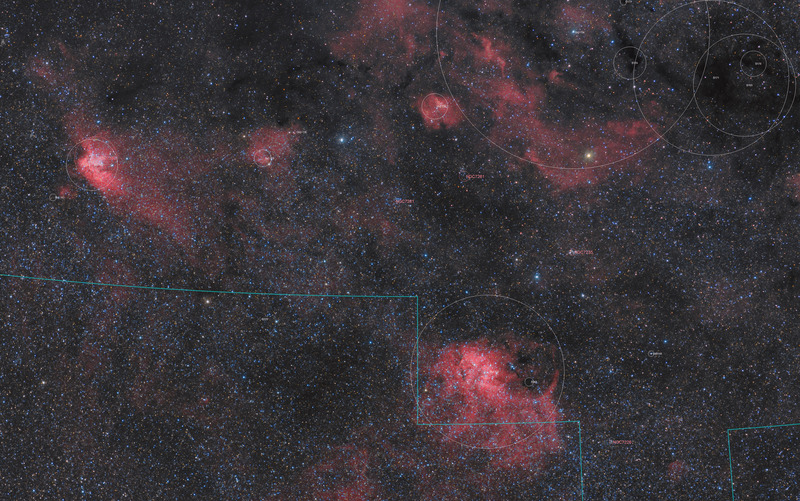 For complete identification of all the objects in this image including a number of open clusters, see the annotated version of this astrophoto. Much of the fainter Ha in this image is more easily seen in the Hydrogen Alpha data used for this image. Software Used Images Plus 5.75 for camera control, Images Plus 6.0 for calibration, stacking, digital development, feature mask, star masking, and star shrinking. Photoshop CS5 used for levels and curves, hue/saturation colorizing, hue adjustments, lab color, selective color, high pass filter, and unsharp mask. Gradient Xterminator for gradient removal. Registar for registration and stack alignment. Carboni Tools for additional noise reduction and smoothing. Focus Magic for focus restoration. HLVG for additional color adjustment. Pixinsight for plate solving and annotating. Notes I tried a slightly different technique for combining the Ha data with the RGB data.l In addition to using a colorized lighten layer, I tried using L*a*b* color mode to blend the Ha data into the lightness channel. I need to refine the technique, as my Ha color is slightly off from what I would like. However, the method was effective in retaining quite a bit of the Ha detail. I was also happy with how the star color blended with the Ha image, as the overall looks is fairly natural.